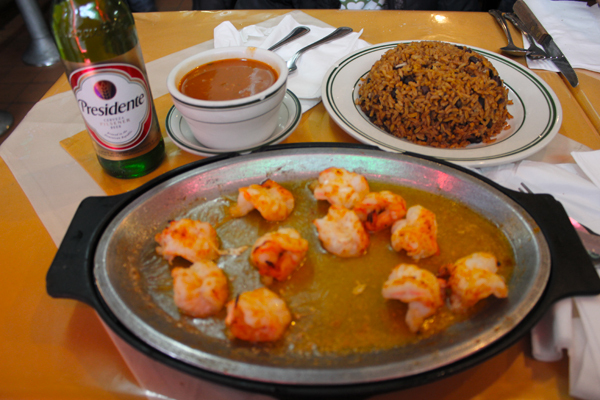 A disclaimer: the best Dominican restaurant in Washington Heights is not actually in Washington Heights…but smack dab in the center of Inwood. That said, this place is real easy to miss, located on 207th Street, right off of Nagle Avenue. Literally steps away from the elevated 1 train station and its associated hustle and bustle, El Lina tends to get lost in its surroundings. The fact that it is confusingly adjacent to a fish joint named El Tina doesn’t help matters much. El Lina doesn’t try to entice, either – its whole ethos is decidedly non-fancy. Its plain glass storefront doesn’t divulge the culinary awesomeness that lies behind its simple doors. The whole restaurant is basically a long lunch counter, some tables, wall mirrors, a kitchen and a jukebox. That is it. Yet and still, this place has been dishing out the best Dominican fare this side of Santiago, Dominican Republic and has been doing it now for almost 26 years. Started by two brothers with roots in the outstanding Pez Dorado restaurant back on the island, this cantina style eatery has working-class DNA. This is where Joe Public, or better yet Pablo Pueblo, eats, and unsurprisingly so. El Lina does not do Nouvo, Fusion or Pan-Latin. What it does (and does well) is down home Dominican food. 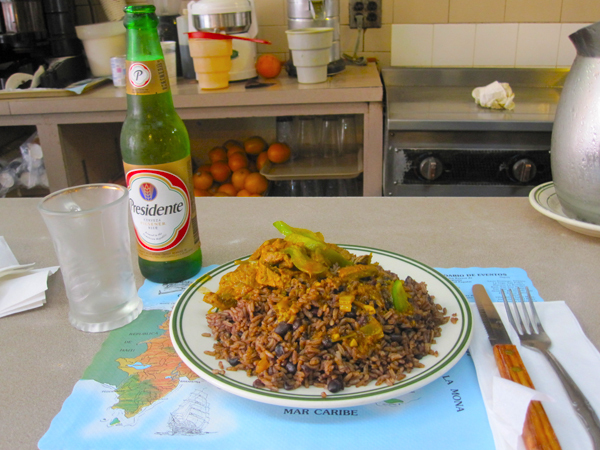 What Dominicans call the bandera; which translates to flag but means rice, beans and meat, is served with a flair that is distinctly Lina, always delicious and accompanied by good old-fashioned Dominican hospitality to match. My absolute favorite item on the menu is the baked shrimp (camarones al horno), which arrives to your table on a platter sizzling and pleasantly but persistently exuding the aroma of garlicky goodness. Accompany this dish with an order of rice and beans, preferably black, and an order of tostones (fried and flattened green plaintains) and you are in heaven. This meal practically begs for an ice-cold Presidente beer to pair with. Another standout is the pepper steak (bistec salteado), which hints at the Chinese influence that is prevalent in the regional cuisine of Santiago. So, kids, there you have it. In a neighborhood that is essentially the unofficial 3rd capital city of the Dominican Republic and boasts many fine Dominican restaurants, El Lina stands alone at the top of the heap. A note of advice for those deciding to make the food pilgrimage to this well-kept Dominican gastronomic secret; in keeping with its old school vibe, El Lina doesn’t accept credit cards, only cash. One last thing, this place makes the best café con leche in town, which is the perfecting ending to a great traditional Dominican meal. 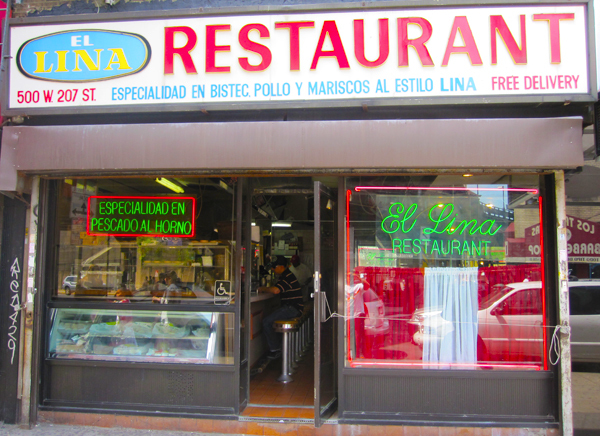 El Lina Restaurant: 500 W. 207th St., off Nagle Ave.